It can be a challenge to find an IIoT gateway that easily connects geographically dispersed devices to the cloud, especially in outdoor or rugged environments. Moxa’s UC series industrial computers are highly integrated Arm-based Linux platforms that include Moxa Industrial Linux. To address the need for an extended lifecycle for products in applications such as renewable energy monitoring, intelligent transportation systems, production line monitoring, and oil and gas artificial lift monitoring, the UC series are ruggedised and come with 10-year Linux support. Recognised for their reliable performance in large-scale deployments worldwide, these IIoT gateways are a trusted choice for all IIoT applications. 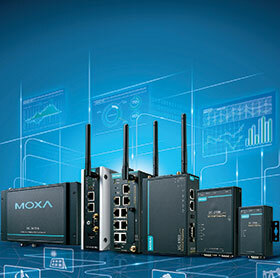 • Moxa Industrial Linux with 10-year, long-term support. • -40 to 85°C wide operating temperature (-40 to 70°C with 4 G LTE). • Crash-free robust file system. • Supports TPM 2.0 security chip on Linux. • Provides utility to enable IEC 62443-4-2 security level. Moxa Industrial Linux (MIL) is a high-performance, industrial-grade Linux distribution, developed by Moxa to help accelerate industrial projects. MIL is based on Debian and the standard Linux kernal, which make it easy to deploy applications on multiple systems. To address the long-term system needs of smart cities and industries such as energy, water, oil and gas, transportation, and factory automation, MIL provides 10-year long-term Linux support that includes security patches and bug fixes, making industrial projects secure and sustainable. In addition, Moxa is working with industry leaders to create a reliable and secure Linux-based embedded software platform that can be sustained for more than 10 years. Moxa is a member of The Linux Foundation and is part of its Civil Infrastructure Platform (CIP) project that aims to create an open-source platform for managing and monitoring smart cities, civil infrastructure and factories, to make them secure, reliable, scalable, and sustainable.